Vegas VIP also offers shuttle service for large groups. Our shuttle buses are similar to a party bus in terms of size, but are situated with rowed seating as opposed to bench seating. Our shuttle buses are equipped with individual cloth seats, air conditioning and heating, AM/FM stereo with CD player and ample storage compartments for personal items. This type of vehicle is perfect for those traveling with larger groups of up to 35 people. Many companies take advantage of this type of people mover as a great option for ferrying people to and from the conventions, airport transfers for large corporate groups or even tours throughout the city. Our shuttle service fleet is part of the newest and cleanest in town. The 20 passenger shuttles are comfortable and have multiple windows for passengers to enjoy the many sights Las Vegas has to offer. Larger shuttle buses can transport groups of up to 35 people. 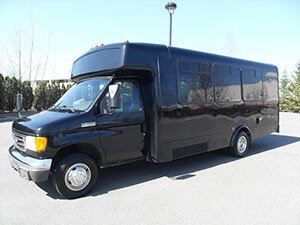 The shuttle bus also offers a generous amount of headroom in the main cabin and plenty of space in the back of the vehicle for luggage, which is perfect for airport transfers and group golf outings. Our shuttle bus drivers are attentive and the safest drivers in town. We always put the customer first and strive to create a good atmosphere in all of our vehicles. If you have questions pertaining to Las Vegas in general, our drivers are there to help. They can answer questions or point you in the right direction on all the activities that Las Vegas has to offer. This includes shows, restaurants, nightlife, gambling, hotels, outdoor activities, and more. Let the staff at Vegas VIP ensure that your transportation needs are met and exceeded next time you come to Las Vegas. Be sure to make arrangements well in advance so we can reserve a shuttle bus for your trip. If you have a large group of friends and you want to find a cheaper alternative to a standard limousine there are still some options open to you. Rather than taking a cab or some other type of transportation you should consider the Las Vegas shuttle service. This low cost alternative will allow your entire group to travel together throughout Las Vegas for next to nothing. The Las Vegas shuttle service differs from limousines because it is cheaper and does not include any of the fancy amenities that can be found in the limousines. While you are missing the expensive entertainment centers, the bar, and the other goodies like televisions and DVD players, you will receive a safe, comfortable ride at a fraction of the price when compared to other transportation options. In addition to transport around Las Vegas, the shuttle service is also available for airport pickup and drop off. As with all VIP Vegas transportation packages, a tip to the driver has been included in the price of the service. **We are not the Nevada based company Las Vegas Limousines, nor Frias Holdings.